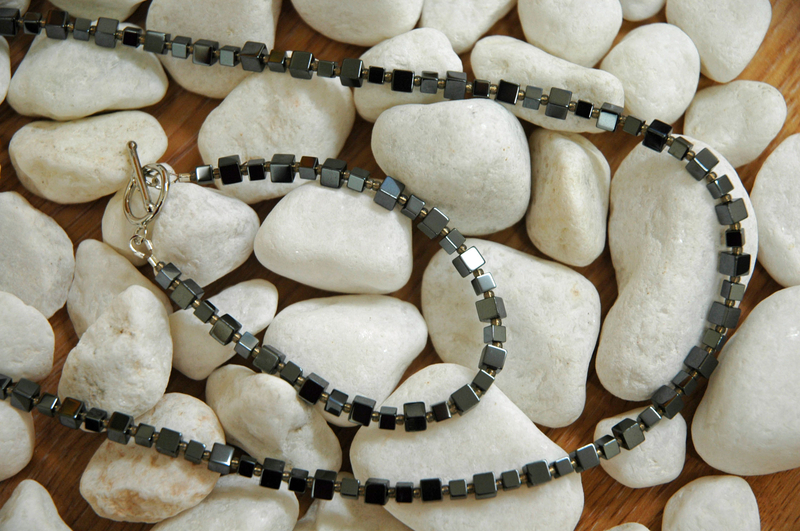 This set of Necklace, earrings and bracelet have been made from small haematite cube beads. Haematite is a lovely stone which has a high iron content and it's this which gives it the lovely metallic finish to the stones. The deep charcoal colour will compliment many different outfit colours. Got a question? Message The Perfect Pinny Company. If for any reason you are not happy with the items you have received because of any fault of High Strung Jewellery you should return the item to Highly Strung Jewellery within 14 days of receipt. A full refund or a replacement item will be sent out to you. The faulty item must be returned to us at your own expense (including all packaging etc). Goods should be returned in a good condition, suitable for resale. I would recommend you return such items using Royal Mail Special Delivery or any other insured and tracked parcel delivery as proof of,posting is not a guaranteed proof of receipt. If the goods returned are found to be damaged, a refund would not be applicable. This will be confirmed to you in writing if such a situation should arise. Please contact me in writing before any arrangements to return items purchased have been arranged. Susie is a lovely shortie cotton pinny with extra long ties and a patch pocket on the side. Amanda is a lovely shortie pinny with long waist ties. She's made from black and white cotton with a contrasting black section which enhances the floral design. There is a patch pocket on the side. Ruth is a full length ladies apron made from a lovely orange and yellow retro design and has matching orange ties and neck band. There are two patch pockets on this apron. This lovely garment will bring.. 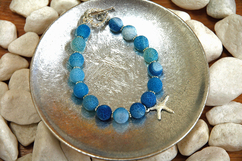 This bracelet has been designed to reflect the colours of a tropical ocean. The stone beads have a crackled finish and no two are the same. It's the colour variations which make the bracelet unusual along..